Easy assembly. Very heavy duty construction. Can be moved by one person. The quality is evident in the materials. Haven't run any clay targets through it yet, but the cycle time is as fast as they say. Very satisfied with this product. Received the Wobble AT-50, Cart, Solar Panel and Foot Switch. All were well packaged so they made it through shipment fine. Instructions for assembly were a little fuzzy at times and I think could have been clearer and better organized. But, having said that, I made it through the assembly with little trouble, it just took a good bit longer than I think it should have. The product itself, is top quality. It is well made and operates great. I've only gotten to use it once so far, but it worked perfectly. We ran through two boxes of clays without a single hitch. My son and two grandsons all give it five stars too!! Very happy with the service received. We received one damaged during shipment and Mike handled it very quickly and efficiently! Have thrown several hundred clays in about a month and LOVE it! Smooth operating, fast, fun. Easy to use. Sweet,awesome,fantastic. I bought the AT50 with the wobble and cart. Put them all together and had a problem with the machine...I believe it was dropped and damaged by the shipper...Called Mike and they worked through it and promptly sent me another one. Quickly replaced the damaged unit and ran over 1,000 clays through the new one. 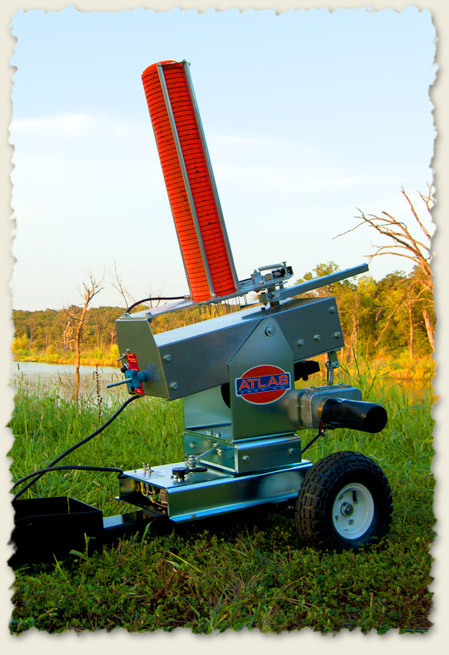 Works great and will recommend it to friends and family as we all shoot clays when we get together. Commercial grad quality. This trap is amazing. With the front of this system elevated 2 to 3 inches from horizontal, it throws the pigeons high and far. The wobble plate gives a randomness of presenting the pigeons. The foot peddle switch is on all the time when stepping on the switch. One has to remember to take the foot off the switch, otherwise it keeps on firing. This is a great product. To move this machine by myself, I remove the thrower section, 3 bolts, for ease of transportation. Otherwise it requires 2 people to lift it. Very happy I picked this unit. The wobble feature add a lot of variety to practice and it keeps you focused. The unit is high quality, does a great job throwing clays and for me the 50 was the right choice. There is some assembly required, but the end product is worth the effort. Atlas also provides a discount to veterans which I greatly appreciate. I would highly recommend the company and their products. Purchased the Wobble AT-50 6 weeks ago. Have ran about 3 cases of clays through the machine. The thrower has worked great. I also purchased the pull cart and foot pedal relaese. The cart makes moving the thrower very easy. The foot pedal release is a lot more convenient then the hand button release. Very please with the thrower and attachments.